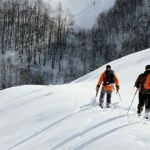 Enjoy ski touring around Gudauri in Caucasus for one or several days, whether you are beginner or experienced skier, with a team of certified mountain guides. My team of 3 IFMGA mountain guides is glad to offer you many options of ski tours around the Gudauri ski resort. 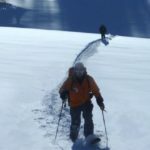 Are you a beginner or do you have experience in ski touring? It doesn’t matter, in any case Gudauri is the place to go! Here you will find varied and interesting ski routes. Their altitudes range from around 1200 m to 3000 m peaks, in the glacier areas. Get the most out of the mountains leaving the lifts behind! We will discover the joy of backcountry skiing. Some of the many highlights of ski touring are the untracked powder and the empty slopes. With alpine touring you get the sense of being headed to undiscovered, remote wilderness. This activity keeps attracting more and more people, but we can still find hidden areas. Indeed, in this part of Caucasus we can go to some of the many hills that remain untouched by others. Therefore, you will feel fresh snow crunching beneath you in these pristine landscapes. We will choose a ski touring itinerary based on your experience and wishes. Moreover, the weather may dictate our plans. Leaving from Gudari, we will go to Arakhveti, Mleta, Pasanauri, Kvesheti, Cross pass, Khando, Sioni, Kobi or Stepantsminda (Kazbegi). Come and enjoy ski touring with excellent stability, perfect weather, and out-of-this-world terrains! Contact me for more info and to book. Then I will be happy to organize the tour you are looking for and guide you in these beautiful mountains. If you are interested, we can also try some heliski in the Greater Caucasus. Not included in the price: transportation costs (depends on the route, varies from 40€ to 60€), safety equipment (transceiver, probe and shovel: 15€) and airbag (10€). 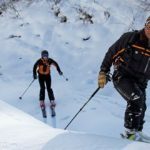 Our team gathers 3 IFMGA mountain guides whose main objective is to offer you quality heli-skiing and ski touring with European standards, in the Caucasus Mountains (Georgia). The Greater Caucasus Range rises up as a majestic mountain landscape, between the Black Sea and the Caspian Sea. In its central part, ten peaks out rival the famous Mont Blanc in height. 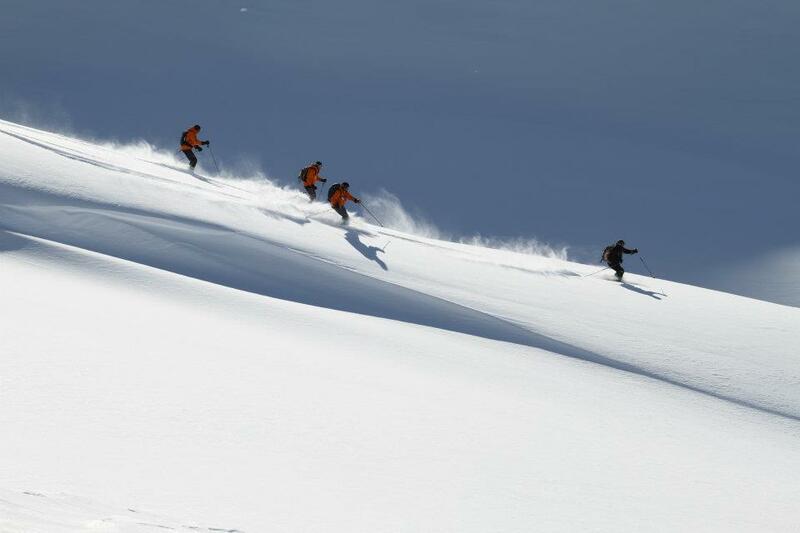 We have an extensive heli-ski area which encompasses over 2000 square kilometres. Our team's commitment to safety and professionalism is paramount. We have chosen leading European helicopter companies to conduct our flights; they provide us with lightweight, powerful helicopters, and highly qualified pilots with extensive mountain flying experience. 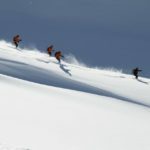 We are all internationally certified mountain guides with years of experience in heliskiing. guide you for some unforgettable experience in Georgia! Best Heliboarding company ever! Top service, very professional and lovely people! Very recommendable! at all the flights and endless powder runs . 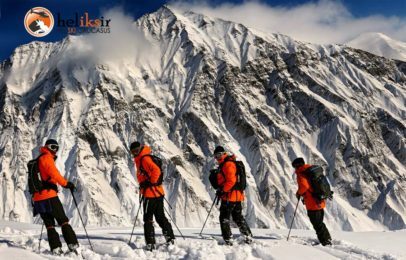 Heliskir organizes the best heliskiing in the Caucasus. Good luck to them and all guests! the magic… Perfect welcome, perfect security briefing, perfect material (ABS, Bieper), very clean chopper, perfect runs….we came back with a huge smile on our faces ! 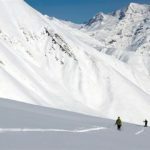 I can warmly recommend the Heliski Caucasus – Heliksir Ltd team if you are in Georgia and want to discover the powder of the great Caucasus. Despite the lack of snow in the resort, we rode only pow !! You will go home with a beautiful experience ! The best heliski company in the world. Recommend to everyone. 2012 was very good, 2014 awesome, looking forward to the next season adventure? was the toughest since ages (too much wind, not enough snow) they found good runs for us for every day!! I can highly recommend it! Top service. Very professional and friendly attitude. We will be back next year for sure! A great getaway with some friends! Off piste skiing - 1+ day - Interm. Ski Touring - 11 days - Interm. Ski Touring - 6 days - Interm. Heliboarding - 6 days - Interm. Heliskiing - 3 days - Interm.